Three cheers for The Scotsman, the first of the mainstream media to publish an article that at last spells out some of the questions arising from the contradiction between the Libya-UK Prisoner Transfer Agreement (which the Libyans and the Blair government wanted to use to transfer al-Megrahi, convicted of involvement in the Lockerbie bombing, from a Scottish to a Libyan prison) and the binding UN resolution which required Megrahi to serve his sentence in the UK. For the first time, too, the Scotsman article exposes the extraordinary arguments devised by the Blair government in an attempt to resolve the contradiction, asserting that despite the UN resolution there would have been no obstacle in international law to transferring Megrahi to a Libyan jail under the PTA, and offering a bizarre justification for the view that the UK could have transferred Megrahi without breaching its political commitment to the original initiative and without the need for the prior agreement of either the US government or the UN Security Council. And, finally, The Scotsman has done us all a favour by publishing the responses to the new article of both the Scottish Justice Secretary, Kenny MacAskill (who took the decision to release Megrahi on compassionate grounds, not to transfer him to a Libyan prison under the PTA), and also of the UK Foreign & Commonwealth Office, whose response seems to imply a failure to grasp the nature of the problem (for both responses, please read on). As the author of the Scotsman article, I have put its full text on my website at http://www.barder.com/lockerbie-megrahi-and-the-prisoner-transfer-agreement-a-mystery. Previously classified documents now declassified and released by the Cabinet Secretary have thrown some new light on these still puzzling and potentially significant questions. Why did the Libyan president Col. Gadaffi and then UK prime minister Tony Blair attach so much importance to concluding a UK-Libyan Prisoner Transfer Agreement under which they clearly envisaged transferring al-Megrahi, convicted of involvement in the Lockerbie bombing and serving his sentence in a Scottish prison, to Libya to serve the rest of his sentence in a Libyan prison, when doing so would have contravened original US-UK initiative, formally approved in a mandatory UN Security Council resolution, which clearly stipulated that his sentence was to be served in the UK (i.e. Scotland)? And why has this glaring contradiction not been dragged out of the shadows and explored in parliament and the mainstream media while those involved — especially Tony Blair, Jack Straw and the Libyan Colonel — are still around to answer the questions and unravel the mystery? The UK side later dropped the proposed exclusion clause under Libyan pressure, assuring the Scots that it would still be open to them to refuse any application for the transfer of Megrahi under the PTA. But since the UK side had admitted in writing that the PTA “would not cover al Megrahi”, what was the point of having the PTA? And why the U-turn later under which the UK side claimed that the PTA could have covered Megrahi after all? A spokesperson for justice secretary Kenny MacAskill said last night: “Sir Brian is absolutely correct. It was clear that both the US government and the American families objected to prisoner transfer, and did so on the basis of formal agreements entered into by the UK Labour government in 1998 regarding the place of imprisonment of anyone convicted of the atrocity. This helpfully, and I think for the first time in a public statement, confirms that the reason for the consistent opposition of the Scottish government to the PTA, and to any suggestion that Megrahi could be transferred to Libya under it, was precisely that it contravened a key provision of the original initiative as approved by a Chapter VII Security Council resolution. But it would be useful to know whether Scottish ministers based their objections to the PTA on this contradiction in their correspondence with the UK government at the time when the UK was negotiating the PTA with the Libyans: and why they didn’t make public until now their reasons for objecting to the PTA. I continue to think that we are entitled to a better answer than that to these troublesome questions. To quote my own Scotsman article: Why did the UK agree a deal with Gaddafi to send Megrahi to a Libyan prison in defiance of a binding United Nations resolution? The Prisoner Transfer Agreement is obviously inconsistent with the US-UK initiative and thus with a binding UN resolution; so what was the point of the PTA? 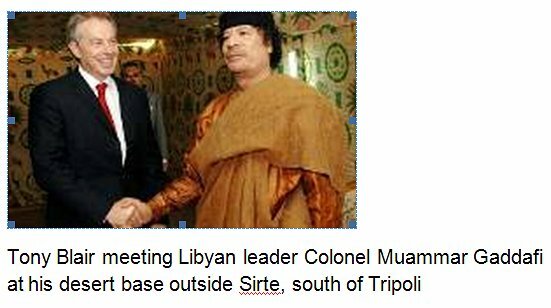 Did Tony Blair or Jack Straw point out to the Libyans during the lengthy negotiation of the Prisoner Transfer Agreement that under the US-UK initiative and the UN resolution Megrahi could not be transferred to a Libyan prison? If not, why not? Were the Libyans or indeed Blair and his accompanying officials aware of the inconsistency — one acknowledged in writing by a junior minister in the Ministry of Justice? Could they have failed to notice it? What were the grounds for the UK government’s assurance to the Scottish government that, despite Lord Hunt’s admission to the contrary, there would be no international law problem over transferring Megrahi under the PTA? How could the then UK government have justified departing unilaterally from the terms of the agreement and the UN resolution without the prior agreement of both the US government and the Security Council? Why has the new Tory government, ever hungry for sticks with which to beat its Labour predecessor, failed to raise these questions, instead contenting itself with holier-than-thou condemnation of MacAskill’s perfectly proper, legal and humane decision to release Megrahi on compassionate grounds? And why, until now, have neither the mainstream media nor, for the most part, the issue-addicted blogosphere, taken these matters up, explored them and demanded better answers than we have been fobbed off with so far? As the King of Siam memorably remarked: Is puzzlement. “Thank you for drawing attention to my article about Megrahi and the Prisoner Transfer Agreement, published in The Scotsman on 17 February. The full text of my article is now available online at http://j.mp/hymmsY. I have also posted on my own blog some further comments on the issues raised in my Scotsman article: please see http://j.mp/eQ7GSN. “I gladly acknowledge that you and a very few other experts on the Lockerbie affair have been drawing attention for a long time to the blatant contradiction between (a) the provision in the original US-UK ‘initiative’ as approved by a legally binding Security Council resolution that anyone convicted of involvement in the Lockerbie bombing should serve his sentence in the UK (effectively meaning in Scotland), and (b) the use of the UK-Libya Prisoner Transfer Agreement to transfer Megrahi to Libya to serve the rest of his sentence in a Libyan prison. I don’t claim to have been the first to spot this contradiction. But the documents declassified and released just two weeks ago by the Cabinet Secretary do throw some fresh light on the subject, showing how the Blair government switched from acknowledging in writing in a ministerial letter to Mr MacAskill that the PTA could not be applied to Megrahi, because of the requirement that he serve his sentence in the UK, to arguing that there would be no obstacle in international law to transferring Megrahi under the PTA and that the UK could transfer him (if the Scottish government were so to decide)under the PTA without the need for the prior agreement of either the US government — a proposition disputed by the Americans — or of the UN Security Council. The documents (perhaps wisely) don’t reveal the grounds for this bizarre assertion about the legal position, but they do set out the then government’s grounds for asserting its right on political grounds to effect a PTA transfer unilaterally, despite the provisions of the initiative and the UN resolution: and these grounds appear to me as a layman to be feeble and unconvincing in the extreme. I hope that you, as a distinguished legal authority with an unrivalled knowledge of the intricacies of Lockerbie, will give us the benefit of your own verdict on the Blair government’s case as revealed in the newly released documents, and on whether you agree with my own verdict on it — perhaps by contributing a definitive ‘comment’ to http://www.barder.com/3110? I should be very grateful, Brian, for any comments you wish to make on my article ‘Lockerbie: Ayatollah’s Vengeance Exacted by Botha’s Regime’ published on Facebook 16 February 2011 (http://www.facebook.com/photo.php?pid=2031228&l=78adbc28db&id=1059719984). Brian writes: Thank you for this. I’ll be interested to read your article when I have a moment, but I confess that I find it impossible to keep up with the enormous and ever-growing literature on Lockerbie (apologies for adding to it myself), and I’m certainly not qualified to comment on any of the various conspiracy theories claiming to reveal, or speculate about, who was really responsible for the atrocity. That is far removed from the subject of my blog post above, which is concerned with the almost entirely separate question of the behaviour during the long saga of the UK, Scottish, Libyan and United States governments in relation to Megrahi (who is reported today to be close to death, finally, while all around him Libya is in flames). As you’ll see when you have a moment, my article aims to be factual rather than to propound any particular theory. What continues to amaze me though is that so little has been said or written about the South African connexion to Lockerbie. It occurs to me* that if anyone is “qualified to comment” on this aspect you, as a former head of the FCO’s Southern African Department, should top the list. Dear Brian – all these are indeed important questions. It is also to my in inteeresting that al-Magrahi had to drop any legal proceedings in the UK before his release was approved even on compassionate grounds. Had he wished to fight for his innocence then the Scottish Criminal Cases Review Commission’s reference to the High Court of justiciary would have had to be heard. As it is, there is a huge dossier hidden away in Scotland which will never see light of day. Some people think that it would not have shown Scottish criminal justice in a good light in relation to the Camp Zeist trial. It also interests me how the Order in Council (made under the United Nations Act 1946) was able to dispense with trial by jury (known as solemn procedure in Scotland). Excellent articles here Brian. I will reference to them from my blog if you indicate your agreement to me doing so. Brian writes: Thank you very much, OJ. I’ll of course be very happy for you to put a link to this post and these comments on your own blog. Megrahi’s decision to abandon his appeal against conviction following the Scottish Criminal Cases Review Commission’s recommendation seems to me another mysterious event which demands exploration and explanation. It’s my understanding that abandonment of his appeal was not a condition of his release on compassionate grounds, and that the appeal could have gone ahead after Megrahi had been released and gone home to Libya, and even after his death (if an interested party could have got a renewed reference from the Review Commission). So why did he abandon the appeal? Transfer to a Libyan prison under the PTA would not have been possible if an appeal had been pending, and it has been reported that Megrahi agreed to drop the appeal when under the impression that he might be transferred under that agreement. But that is difficult to understand: Megrahi and his legal advisers must surely have known that the Scottish government had consistently opposed transfer under the PTA, precisely because transferring him to a Libyan prison would have been contrary to the original stipulation that the sentence was to be served in the UK. And as the decision was exclusively that of Scottish ministers, how can Megrahi have imagined that transfer under the PTA was a possibility that justified him in dropping his appeal? Anyone of a seriously suspicious disposition might even wonder whether someone — but who? — was so anxious to prevent the appeal going ahead, because of what inconvenient truths it might reveal, and the damage it might do to the reputation of Scottish justice if it succeeded, that Megrahi was deliberately misled into believing that PTA transfer was being positively considered — but that of course he would have to drop his appeal if such a transfer were to be approved. That deeply disagreeable hypothesis is indeed given additional support by the (otherwise inexplicable) reversal of the UK government’s position on the applicability of the PTA to Megrahi. Having stated categorically to the Edinburgh government and to the Libyans that the PTA could not apply to Megrahi (because of the stipulation that the sentence must be served in the UK), HMG then went into reverse and declared that there was no obstacle in international law to the use of the PTA to transfer Megrahi and that even the UK’s political commitment to the sentence being served in the UK under the original US-UK initiative, as endorsed by the mandatory UN resolution, would not necessarily prevent the UK transferring him under the PTA, even if the US government or (by implication) the UN Security Council were to object. Could it be that this change of position was part of an effort to convince Megrahi and his lawyers that PTA transfer was a real possibility — but only on condition that he abandoned his appeal? We know that several UK government certificates of public interest immunity were used at Megrahi’s trial to prevent certain documents being used in evidence, and that some of the grounds for the conclusions of the Scottish Criminal Cases Review Commission (that a miscarriage of justice might have occurred and that there were grounds for another appeal) have never been published. Someone somewhere has an interest in keeping these documents and arguments under wraps: if the appeal had been allowed to go ahead, it might have proved impossible to continue to withhold them from the appeal court and from public exposure. If Megrahi could be deceived into believing that if he dropped the appeal he would, or might, be released under the PTA, that danger would have been averted. If so, who practised that deception on Megrahi? Or was it in fact a deception? Might the Scottish ministers actually have contemplated using the PTA to transfer Megrahi to Libya in exchange for his dropping his appeal, despite their long-standing opposition to that course? In the event, they would have had no need to carry out their side of such a dubious (and hypothetical) bargain because the cancer diagnosis enabled them to release him without resorting to the PTA. By that time, the appeal had been abandoned and its attendant dangers averted, with no need for any public disavowal of the Scottish ministers’ consistent opposition to the PTA. Pure speculation, of course. But, taken with all the other unanswered questions, surely there are ample grounds for a proper independent judicial inquiry into the entire deeply unsatisfactory affair? Brian writes: Thank you, yes: I had seen this. Not only was it predictable that sooner or later a Libyan defecting from Gaddafi would claim to have evidence that Gaddafi had been responsible for Lockerbie: it was actually predicted by more than one commentator in recent days. The propensity of defectors for offering to their new hosts and protectors information that they may be assumed to welcome has a long tradition. Much of the evidence for Saddam Hussein’s non-existent WMD came from Iraqi defectors. Of course, like information got by torture, that doesn’t necessarily make it false. Mustafa Abdel-Jalil may yet produce irrefutable evidence that Gaddafi himself gave the order for the Lockerbie bombing. But even if he does, that won’t necessarily prove that al-Megrahi was involved in the ways alleged at his trial. And even if he was, that doesn’t necessarily demonstrate that the trial was properly conducted, that none of the crucial evidence was tampered with or withheld, that the identification of Megrahi was procedurally water-tight, or, consequently, that his conviction was safe. Serious doubts continue to surround all these matters and most will remain to be resolved whether or not Gaddafi’s and Libya’s guilt in the matter comes to be firmly established now. Now see Lockerbie: Cameron’s Nuclear Secret (http://www.facebook.com/photo.php?pid=2071496&l=c14f1ea35c&id=1059719984). Previous story Why on earth shouldn’t prisoners vote?